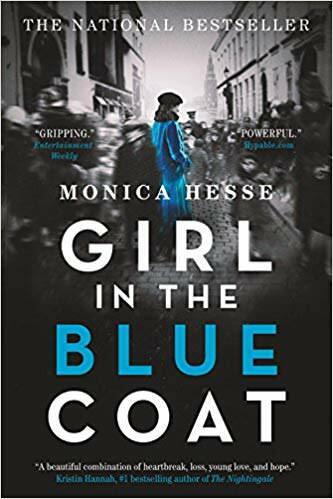 The Girl in the Blue Coat by Monica Hesse is a young adult award winning novel, a national bestseller, which takes place in Holland during World War II. Ms. Hesse is an author and a journalist with the Washington Post. I have had this book in my house for a while, my wife bought it and I never got around to read it even though the subject matter is right up my alley. One of my trepidation about reading The Girl in the Blue Coat by Monica Hesse is that it is a book geared towards young adults (YA), even though I have read, and enjoyed, many YA books previously the moment just didn’t seem right. I have a young adult in my household, and figured at some point she might, hopefully, will read this book and hence I’ll already be a step ahead. The subject, content, and narrative of the book all fit neatly in what one would expect from the genre, that being said, the novel is still engaging. The story moves fast, it tells of the struggles of a population under foreign invaders whose friends and neighbors are being targeted. A war story which is not about the soldiers or the victims (in context of the ones the Nazis chose to murder), but about a young lady trying to stay below the proverbial radar and make ends meet. The underlying theme to the book is the famous quote attributed to the Irish philosopher and statesman Edmund Burke: “The Only Thing Necessary for the Triumph of Evil is that Good Men Do Nothing“. The young protagonist learns that she can’t simply wait on the sidelines while atrocities are happening right in front of her, no matter how much she tries to ignore reality, but she must do her part, even if it’s just a small contribution (which for someone else might be a life saving measure). Hanneke, a young woman, deals with black market goods which are hard to get in Nazi occupied Holland, 1943. On a routine delivery Mrs. Janssen, one of Hanneke’s repeat customers, pleads with her to help her find a young Jewish teenager she’s been hiding. Hanneke reluctantly agrees to help, only to be drawn into a web of resistance fighters, turmoil, and revelations taking on the Nazi war machine. Dis­claimer: I got this book from the local library.